Here is our opinionated guide to the most essential books on the history of theatrical deception during The Golden Age of show business. This is one of the most entertaining and well written books about the wrestling business in the mid 1900s, written by a Sports Illustrated writer and son of a professional wrestler. One chapter is devoted to Gorgeous George. These titles are available directly from author Scott Teal at Crowbar Press. Scott Teal specializes in interviews with former wrestling stars and does an outstanding job of preserving the oral history of a bygone era of show business, giving the reader an inside view and an intimate sense of what it was like to be a part of professional wrestling entertainment during The Golden Age. Dave Meltzer is the best writer of wrestler's obituaries. The subjects of his two Tributes compilations are not all wrestlers of The Golden Age, but most are. Fall Guys was the first book to expose at length the inner workings of the wrestling business. The original edition is now very rare and pricey but a reprint is available from Crowbar Press. Unfortunately this classic sells for $200-$400, even on Ebay, as it rarely comes up for auction. Serious bibliophiles may want to check with a rare book dealer. This is the bible of wrestling titles and is instructive on many levels. At this printing new copies are no longer available from the authors. Click here to be directed to their site and learn why. This is an essential resource, so try to find a copy to add to your pro wrestling history library. The book appears on Ebay from time to time. Written by an investigative reporter at the Washington Post, this well-documented book vividly reveals the less glamorous elements of the pro wrestling business during the early to mid twentieth century. Although this book is out of print, it is not difficult to find. It features some down-to-earth reminiscences of some of Britain's leading Golden Age grapplers. 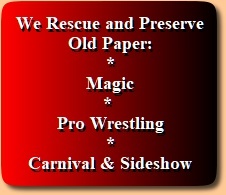 These are must reads for the serious carnival and sideshow historian. This book is a compilation of selected chapters from Taylor's periodically published series of the same title. Serious students of sideshow history should endeavor to get all nine issues. This is a photo illustrated and expanded edition of a best selling book published in 1950 as Step Right Up. The world would be a better, more tolerant and peaceful place to live if this classic were required reading somewhere during grades 7-12. This is another recent issue of a long out-of-print classic by Dan Mannix. This is the bible of sideshow banner art and artists, a fascinating read even for the nonartistic. Go here to get a personally inscribed copy from co-author Johnny Meah, The Czar of the Bizarre. If you have ever wanted to run away with the carnival you will want to find a copy of this book. Even though it is full of inaccuracies and outright lies, and is therefore despised by knowledgeable old carnies, it might be worth the read, but only if you take it with a grain of salt. It was written as an expose but is really mostly fiction. This is a fairly difficult book to obtain; Ebay may be your best chance to find it. Even though this is qualitative research written by a professor of sociology at Syracuse University, with hundreds of sources cited in a standard academic style, it is not too stuffy and is enjoyable to read. This classic, written by the author of Nightmare Alley and Houdini: The Man Who Walked Through Walls, may be expensive and difficult to obtain. Copies have sold on Ebay for over $200 but recently prices seem to be dropping. Note: all copies of this title have rather badly yellowed pages. Mixing fact, imagination, and plain old balderdash, Lewiston paints an energetic and earthy story of early 20th century outdoor show business. This title, written by the famed author of our #1 title, may be hard to find. This book crops up on Ebay two or three time a year. It's a must read from one of the really big names in carnival and world's fair entertainment. This well written book is at once scholarly and entertaining, covering the years leading up to the Golden Age of sideshow. A must for the P T Barnum enthusiast. This endearing tale, written from a mother's point of view, is the true account of a young couple who hit the road for one season in the 1970s. A good read for anyone who has considered giving the carnival business a shot. This is another fairly difficult book to obtain. Ebay may be your best chance to find it. Or you might contact Ward Hall directly. He is one of the true gentlemen of the outdoor amusement business. Try the interlibrary loan desk at your local library to acquaint yourself with this essential volume. A paperback reprint of this invaluable resource is now available at a very reasonable price. As with our #1 choice, you may want to try the interlibrary loan desk at your local library to borrow a reading copy of this required volume. The Evans titles are now rare and pricey, but worth the investment. This book is widely available, both in hardback and softcover editions. This title is out of print but widely available at reasonable prices. This comprehensive and profusely illustrated French work will be very difficult to obtain. Reading proficiency in French is required. Searching rare book dealers in France may be your best bet. This 465 page volume meets established scholastic standards of research and is considered by many to be the ultimate Houdini biography. Silverman was a Professor of English at New York University whose earlier biography of Cotton Mather won both the Pulitzer and Bancroft prizes.